In a digital world, analogue marketing can cut through the noise. Take for instance a recent promotion by Target to launch the new Mario Kart Deluxe 8 game with special interactive in store promotional graphics. 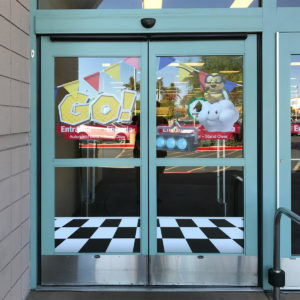 Guests in 656 locations across the US had the chance to “drive” a Mario, Luigi or Princess Peach shopping cart though the entrance with start line audio and graphics. Guests of all ages enjoyed the fun for the two-week promotion. Some even dressed up as their favorite Nintendo character and shared pictures on Target’s Twitter feed and personal Facebook posts. Out in front of the stores, the iconic red bollards were decorated with Mario and Luigi heads, sparking the attention of shoppers. Each of the three graphic promotional products presented unique challenges to overcome. Creativity, experience, and vision of a safe and cost effective solution was the focus of our BPGraphics team. 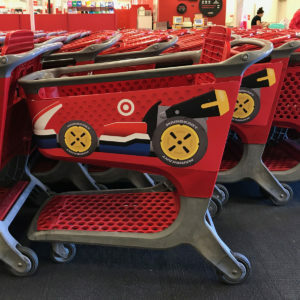 The shopping carts needed to look like mini racers but then go back into the corral unharmed. Our solution involved producing the cart graphics on a die cut styrene which is both flexible and durable. The cart piece utilized various adhesive tapes instead of hardware, thus allowing easy install and removal by the store employee. The bollards were produced via dye-sublimation printing on a flame retardant fabric that would stand up well in all weather elements. Producing graphics on a stretch fabric and then running that fabric though a computer controlled cutter was its own project. But in the end, our team created a solution that was fast and laser accurate for the next step, complex sewing. Security of the outside bollard cover was also a concern that needed a solution. This was solved by simply using a cable tie threaded through the sewn Velcro closure at the bottom of the sphere. Less than 1% of the highly visible bollard covers were stolen. The entry door graphics needed to appear to float in space and (for security reasons) not have a blurred image in the non-printed areas. By using our optically clear, low tack vinyl, a floating cloud graphic visually prepared racers as they passed under the sound box sensor. All these graphics were produced so the Target install team could set everything up; saving the extra cost and time to hire professional installers. BPGraphics didn’t just produce the graphics, but also produced a series of training videos and step-by-step instructions for the in-store install graphics team. This extra effort provided a consistent look across 656 locations nationwide. For an idea of the promotion’s popularity, just search @target Mario in your Twitter feed. “Target has increased the smiles and enhanced the shopping experience when their guests enter Target stores. Check out our videos showing the production of these fun graphics. Bollards, Window Graphics, and the popular Shopping Cart. Next time you or your client need a printer that can solves large scale challenges, creates breath taking graphics and produces training aids; call BPGraphics! We are the specialists in big ideas.